Thanks to our sponsors, we have had the opportunity to use some of the latest hi-tech equipment: a laptop computer to store and enhance digital images, update these Web pages and get connected to the Internet; a solar panel to provide power to the laptop even in the Highlands' most remote spot; a special panoramic head to help us building the QTVR virtual scenes and an excellent digital camera to share with you the images of the best prehistoric sites of Scotland. Of course, we have also carried with us some "old friends": Nikon F3 and F4 cameras, an array of Nikkor lenses, several hundreds of Fujichrome Velvia 50 and Kodak Royal Gold 100 film rolls, Manfrotto 302 QTVR and 222 heads and a Mini 190 tripod. While in Scotland, our Internet connection was provided by CompuServe and the modem we used was a GlobalVillage Platinum PC Card. Special thanks to Andrea Tolin (Apple Italia), Nick Bell (Keep It Simple Systems) and Stefano Traldi (Polyphoto/Olympus Italia). The Apple PowerBook G3 is the fastest notebook in the world. Faster than any Pentium, thanks to its 250 MHz PowerPC G3 processor designed to optimize the Mac OS with a 512K L2 backside cache memory. There is an ATA IDE internal hard disk drive to store up to 5GB of data and the installed RAM is 64 MB, expandable up to 160 MB. A Lithium-Ion battery provides two to four hour of mobile computing, while the 12,1" active matrix-display with 800 x 600 pixel may show images with up to 256 thousand colors. 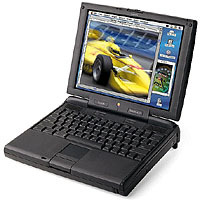 The PowerBook G3 has a unique four-speaker, 16 bit CD-quality stereo sound system and accomodates two Type II PC cards or one Type III PC card. It ships with a 3,5" floppy disk drive plus a 20x speed CD-ROM module; it is worth noting that the system allows swapping of expansion bay modules without powering down. There is also a built-in 10Base-T Ethernet connector and an infrared wireless IRTalk/IrDA data transfer system. 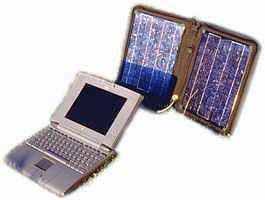 The PowerBook G3 weighs 3.5 kg (7.7 lbs) with CD-ROM module and its dimensions are 6.1 x 29.2 x 24.1cm (2.4" x 11.5" x 9.5"). The KISS Solar System - Mercury II combines two high-efficiency solar panels to provide additional power for extended runtime, as well as recharge capabilities, to almost any portable electronic device, no matter how far you are from an outlet. The Mercury II features the SmartAdapter / SmartCord power regulation system which makes it easy to charge a wide range of devices with just the swap of a cord. This system allows you to support your device from the solar panels, from your automobile's cigarette lighter, or from an external storage battery. The multi-crystalline cells incorporated into the Mercury II has an average lifespan of over 20 years, and are encapsulated in a tough, durable epoxy/resin composite material, which makes them lightweight yet rugged. This digital camera has a light-weight, built-in 3X f2.8 zoom lens with macro capabilities and a TTL (through the lens) single lens reflex type viewfinder. A high-quality progressive scan CCD (charged coupled device) with 1.4 mega pixel is used in the C-1400L, allowing entire image capture in a single pass, and creating images at 1280 x 1024 and 640 x 512 pixel resolutions. Utilizing a SmartMedia removable media, there is no restriction on the number of photos that can be captured. SmartMedia cards are compact, and easily downloadable to Windows and Macintosh computers via a serial cable, through a PCMCIA adapter, or through a 3.5" floppy disk adapter. After images have been saved or printed the card can be erased and is ready to accept more images. 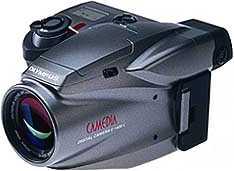 The C-1400L comes with a 4 MB card that can store 4 - 50 images. On the camera's back there is a color LCD panel which allows immediate viewing and selection of the images stored in memory. There is also a built-in flash with a working range of up to 12 feet The camera is very light weight at 16.5 ounces, and has compact dimensions of 4.5" (W) x 3.25" (H) x 5.1" (L).